BASKETBALL SPOTLIGHT NEWS: Gunning For #1: Evan Young Ready To Represent Utah At Future Phenom Camp! Gunning For #1: Evan Young Ready To Represent Utah At Future Phenom Camp! With a heavy national contingent of players expected from all across the country Young will be joining the Basketball Spotlight Future Phenom Camp out of Utah. Long considered one of the best pure shooters in the class, we love the fact that each time we see him he has something more to his game. Working off the jumper, he is able to hurt you in multiple ways as this must always be honored – a underrated ball-handler with great court vision he finishes in the paint and can does a lot of great things in the mid-range and with the floater. The proverbial gym rat will put Utah on the map without question come August 22nd and 23rd at the Basketball Spotlight Future Phenom Camp. In the gym range combined with the ability to give you a bucket anywhere on the floor we like the size and strength combination as well. He never gives up on a play and does it every possession of every game displaying a next level motor. 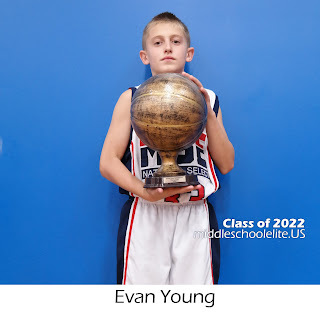 Those who love the game will love Evan as he plays as hard as any player in any age group in the country; bring your hardhat to Phenom Camp as Young will be there waiting for all comers.